A Belleville, Illinois business owner was fined $31,000 for posting a political sign inside her sandwich shop. Dianne Rogge, the owner of Pour Haus, is charged $500 every day she leaves the sign up in her shop. A Metro East storefront is now at the center of a federal lawsuit after city officials told the owner a posted sign was illegal. The owner of Pour Haus is suing the City of Belleville after officials told her to take down a sign that sarcastically thanks the city for turning down the her request for tax breaks to start up a sandwich shop. “You’re allowed to put political statements anywhere you want and this is my business. It’s inside, it follows the sign ordinance, and therefore I’m not breaking any laws. You cannot stomp all over the constitution; Belleville or anybody else,” Dianne Rogge, the owner of Pour Haus, said. Rogge told News 4, the City of Belleville has fined her $500 every day the sign stays up. 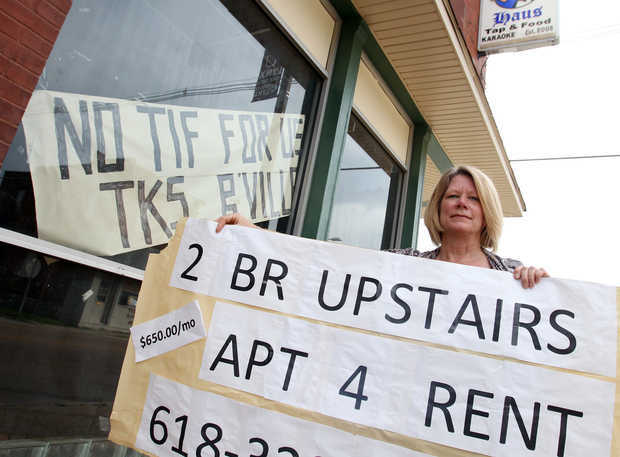 The sign was placed in the storefront window on June 5; her fine is up to $31,000.